Its that time of year again for tax preparation. This can be very overwhelming and very stressful! Here are a few tips and resources to get you through. Start with baby steps and early March is the best time to start. Set up sessions for yourself for one or two hours at a time so you can work efficiently. Write your sessions in your calendar and have a deadline well before April 15. Not sure what to gather? Everyone has different items to gather, but generally these items are the following. Income includes your W-2 and 1099’s. These come in envelopes marked Important Tax Document and will be easy to find in your mail. Or these can be found online from your employer or in investment accounts. You may have already set up ways to find these documents easily online! Expense/Deductions include home mortgage interest (From 1098), property taxes paid to your school district and county, and charitable contributions. Property taxes may be escrowed in your mortgage, and you can find these payments listed on your monthly December mortgage statement. Charitable contributions can be found in reviewing your checking account online. Non-cash charitable contributions can be valued with ItsDeductible.com online too. File online for the quickest return. Keep your filed return forever, either on paper or electronically. 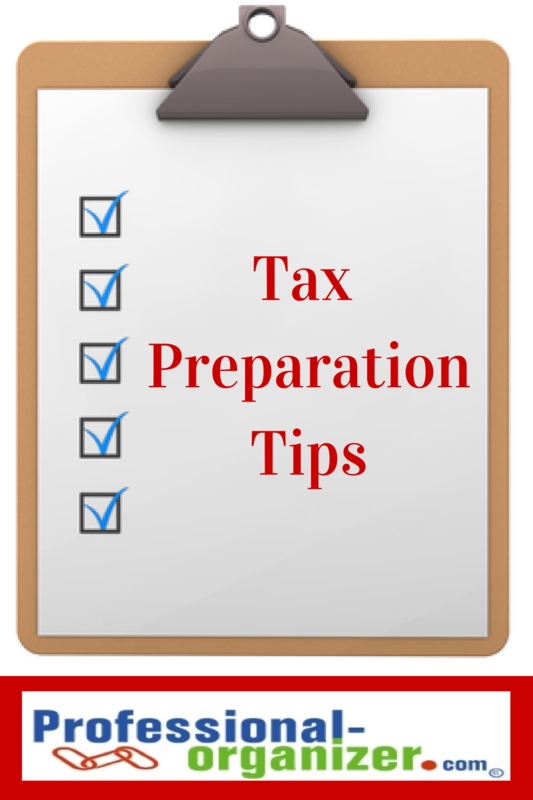 Ask your accountant how long to keep the preparation documents. There is differing advice on this but most say at least 3 years. Get ahead for next year by setting up folders to use throughout the year for income and deductions. In our busy lives, information and paper come at us from all directions all the time! Where does all this come from? It comes in with the mail, from school or work, or in your purse! These items require immediate action, with dates and times to enter on our calendar, bills to pay, or addresses or service providers we may need later. The Command Center is a space for information and paper that needs easy access and quick retrieval. Keep organized with a command center for paper. Our first decision is where best to create the space for this work zone. Where do you see these papers? In most homes, it is the kitchen since it is the hub of your home. In the office it is on your desk or on your credenza. However, if your home office is on the first floor and in a central part of your home, this is a great space to establish this area. Your command center for paper must be located where it’s most valuable. Begin by reviewing the current clutter that’s on your desk or counter. Start by deciding what to keep and what to toss. Be decisive! This ensures keeping only what you need. Continue by sorting your papers into the categories that work for you. Most people need these categories: to do, to pay, to scan, pending, and to file. Other categories include the names of each of your children and partner, weekly activities, other school and organizations’ papers. At work these categories include your assistant, your boss, hot projects and resources. Now that you have categories, decide what organizing product might assist you best in keeping these papers in order. Look around the space, measure the area for size, and think about your personal organizing style. 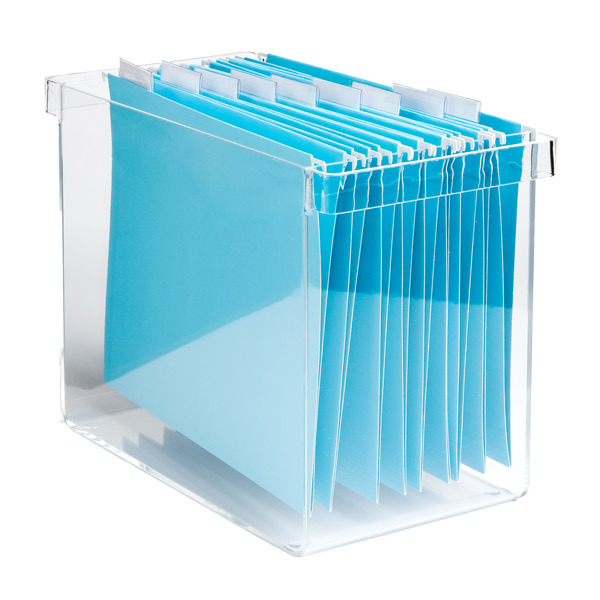 Look for a desktop file suited to the décor of the space with hanging files to label with each category. You can also use wall pockets, one for each category, if you have h ave vertical space. Be sure to choose a product you love and this will help you stay organized. A calendar and bulletin board are a vital tools in this area too! Add a month at a glance calendar where everyone can record their activities. Placing it where all the family or your work colleagues can see it helps everyone stay on top of weekly plans. Designate an administrative time for you to work on the command center. This routine usually takes just one hour a week, especially if you choose a time you are high energy to get the job done. Write your administrative time in your personal calendar to commit to the time and make yourself accountable to get the job done. Creating a family Command Center and a work Command Center makes the difference in keeping information accessible and easy to locate. Find the right space, the right categories, the right products and the right time to make this work for you. You benefit by having balance and peace of mind! Want more ideas on a command center for papers? Visit my pinterest board Command Centers for Communication and Cohesiveness. 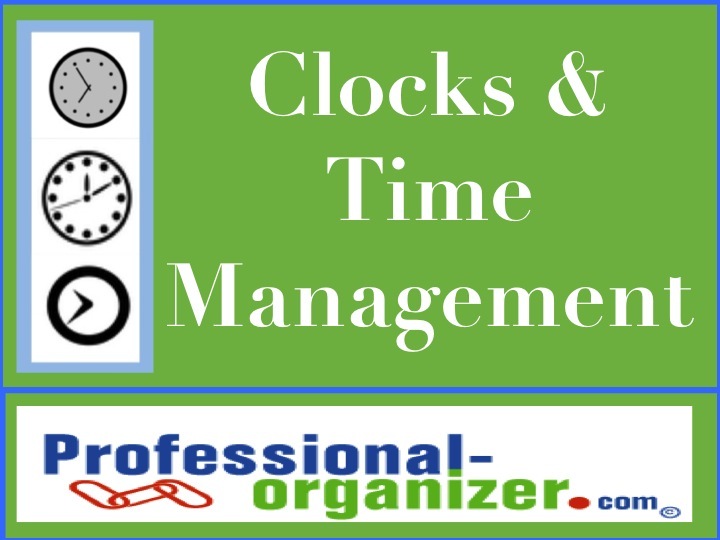 I am often asked for “my” organizing ideas, including tips, tricks and tools. Here are the top 12 for me! 1. Always shop with a list. 2. Know where an item will be located in your home, before you purchase it. 3. Set up specific spots for specific items, such as only clothes in your master closet or only paper in your office. 4. Commit to tasks and responsibilities only after checking your calendar. 5. Anything that is really going to happen, has to be listed on a date on your calendar. 6. Go through your paper for 5 minutes every day. Spend one hour once a week paying bills and working on admin tasks. 7. Know what papers to keep, and how long to keep them. Ask your accountant or lawyer for your personal dates and details. 8. Always keep a list of tasks, not matter how small the task or how short the list. 9. Use versatile organizing products in many different places, such as the back of the door shoe holder used in the craft room for crafts, toy room for matchbox cars, or back door for bug spray. 10. Find organizing products that you love, that match the decor of the space they will be used, and that have ways to separate and categorize your items. 11. Any big project is best done in baby steps, one hour at a time. 12. Keep it simple sweetie! The simpler, the better! There are many ways we go over the top! It may be over purchasing, over eating or over committing. But there are a few small ways we can un-do the over the top. 1. Start with an awareness of where we go over the top. It is when we are sad, mad or lonely. It is when we are bored or just need something new. With this awareness comes the power to change. It is when we next feel that emotion that we can stop going over board. 2. Un-doing something needs to start with a baby step. It can be just knowing that we can have a slice of pie, but not the whole pie. We can order one new blouse online, but not every color. We don’t have to be on every committee on the PTA, just one what we are really strong. Paring down and establishing a minimum are ways to move away from over the top. 3. Creating loving accountability can help us reign in our over the moon behaviours. Loving accountability is trusting someone to help you stay on track. It is sharing what your goal is, then having that trusted someone be there for you. 4. Know what is enough by setting good limits and boundaries for yourself. Is enough a number? Like a budget? Is it a feeling? Like being full after dinner? Is it an emotion? Like satisfaction? Start learning what your “enough” is so that you can put it into practice. Do you know what “enough” is for you? Share your way of knowing! Fido your pooch and Fifi your cat need your help! They are happy in your home, but they need a little TLC with regard to organizing. Healthy pets need routine care. Keep your pet medicines in the kitchen in easy to access spot. Mark your calendar for monthly medicines and annual shots that keep your pets in great health. Use your recurring events feature on your phone or your paper planner to mark in these important dates. Daily walks with your pet enhance your and their lives. Make it easy with a pretty hook for the leashes by the door. Assign a time, once a day, that you get out and enjoy the fresh air with them. Share the responsibilities of pet care with your family members. Post a community chart with your kids’ assignments for feeding, walking, and bathing your pets. Keep your pet foods in air tight containers on the floor of your pantry. Having a measuring cup in the container dedicated to feeding makes it easier too! Our pets are our family! What do you do to remain organized with your furry family members? I love my new shiny status as Superstar! It is a collaboration I participate in just about every month, with other organizers throughout the country. But to me it is really a shining star about collaboration in general. I love to find partners that are a great fit for what I don’t do well. As a member of this collaboration, I am prompted monthly to submit. The topic is already chosen, so in many ways it is just following up on a great idea. How do I use this collaboration process throughout my work and life? I find having partners who give you enough information to get started on whatever the task, either with a template or not, and then move forward. It can be when I want to give a speech, add a new aspect to my business, or even make dinner for our family. It is always more fun when you work together! How can collaboration help you get started, get finished or get moving on a goal? Donating and decluttering requre *LOVE*! It is your passion that fuels sharing your stuff and more. There is an endless list of philanthropies in our area. Here are just a few. Dress for Success. Share your work attire with those re-entering the work place. Goodwill. Its where people get jobs! What are you passionate about? Add to the list!